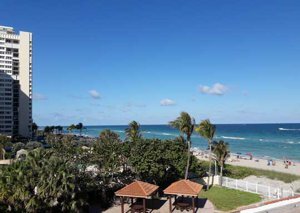 A boutique oceanfront condo complex of only 95 owners located on the beachfront of Hallandale Beach just steps to some of the areas high rise developments and luxury million dollars listings. Hallandale Beach is the next big thing in South Florida. High in demand in the mid-1960 co-ops used to be a popular way of building a complex back then. I lease the land for 100 years, put up a building and sell the units, it is a win-win situation for both buyers and landowners. Landowner collects the rent guaranteed for the next 100 years, the condo owners buy the beachfront condo at a much-reduced price. 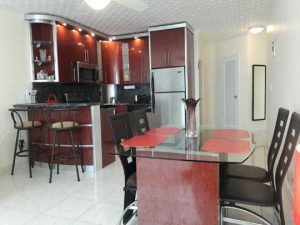 Certify it as a 55+ community and you have a desirable beachfront condo that is affordable and a desirable place to live. As the saying goes “they do not build any more beachfront” and that is very true. Recently a small lot in Sunny Isles, now a home to the almost completed Muse Residences, has been sold for $28mil. Muse will feature luxury boutique beachfront residences starting at an $1800 per square foot fully turnkey ready. Nothing but to decorate here, as the floors, closets, and painting will be fully completed by the developer. A more recent transaction involving oceanfront land at the 2000 S Ocean Drive sold for $32mil. Again, to make room for the boutique luxury beachfront residences of the 2000 Ocean. Similar to the Muse Residences in Sunny Isles, 2000 Ocean will feature luxury limited living high rise beachfront condos in Hallandale Beach with direct ocean and Intracoastal views. Residences will come completely finished but starting at $900 per square foot and a modestly higher price as you go up. All the condos in the 2000 Ocean will have direct ocean and city views. Well, guess what, the Taromina complex is literally just a few short steps to the north of the 2000 Ocean complex. A four-story building of only 95 residences with a direct beachfront location at a fraction of the price of anything in the area. Granted we are comparing apples and watermelons when it comes to the amenities and what the two complexes have to offer. But if you are looking for comfortable retirement living or a vacation getaway on the beach, it just does not get any better. We currently have two listings in the Taromina available for sale. Both residences are on the high floor and feature same interior layout and 878 square feet of interior living. The community does not have fancy amenities, but what it does have is an amazing beachfront location with oceanfront pool and clubhouse at affordable beachfront location and supper low condo fees of only $206 per month. Spacious units over 800 square feet of living space in the oceanfront Taromina 55+ complex have an exterior catwalk, so the condos feature a straight through design and direct beach location. Located in the center of Hallandale Beach at 1936 S Ocean Drive you are minutes away from all the shopping and dining around the area and within 30 minutes from Miami, Fort Lauderdale, Sunny Isles Beach, and Aventura. 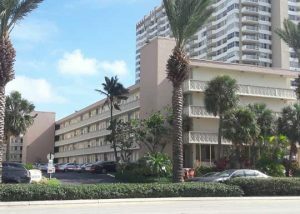 Give us a call to see what this boutique beachfront complex has to offer, and see first hand what a difference Taromina 55+ living can be on the oceanfront of Hallandale Beach FL. Call Direct 786-505-4786.